Applying for a pavement licence can be daunting. However, it isn’t that hard. We’ve put together a few tips to help you apply and a few places that you can go for help. What is a pavement licence (also known as a pavement consent)? Pavement licences are aimed at offering the local public and visitors to the area the chance to eat and drink outside your facilities. Effectively as your council owns this area, they must ensure that the use of tables and chairs do not have a detrimental effect on the ambience and that the rights of all users of the highway are protected. As an example, to ensure pushchair and wheelchair access remains clear at all times. The pavement licence can be a means of adding more life to the area, helping to maximise the use of public spaces and offer a further range of facilities for people who live, work and visit the area. The allowance of any permission to use council land, is considered on its own merits and discretionary. The decision may vary dependant on the local council you just happen to have your business in. Usually a new pavement licence will be agreed for no more than eight months. (1 March – 31 October). You will need a plan of the area where the furniture is to be placed and a photograph(s) of the furniture to be used. This include the Cafe Barriers, the banners, and the print you want. Brandline Products do offer a free of charge service which provides a proof of your design for the cafe banners. When it is unlikely to be approved. Full details of all requirements can usually be found in your councils current pavement licence policy. To assist you in finding this, we’ve painstakingly put together a list of local and county authorities that can help. 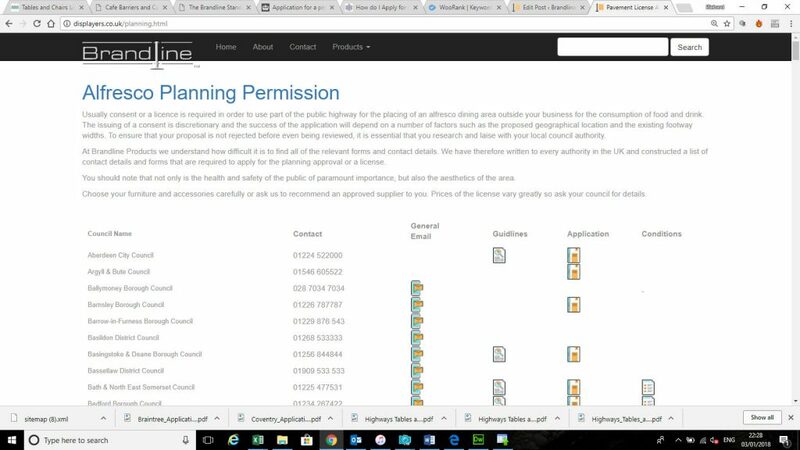 It may be wise to chat informally to the planning department prior to applying for a licence because you may also need planning permission. This entry was posted in Cafe Barriers, Cafe Planters, Uncategorised and tagged authorities, cafe barriers, pavement license. Bookmark the permalink.